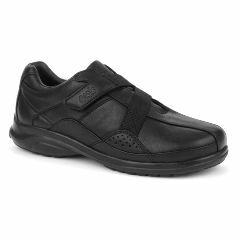 AllegroMedical.com presents The Oasis Women's Alana Hook & Loop Black Diabetic Shoe. Our shoes have been designed with minimal internal seams to reduce the risk of chafing and maximize comfort. Our shoes are highly recommended for diabetics and most styles. Unparalleled in quality and comfort, Oasis shoes are designed to look as good as they feel, not to look orthopedic. Premium materials combined with unique constructions provide relief from myriad foot ailments. All Oasis shoes are extra-depth and include removable spacers to accommodate orthotics. Alana is an extremely lightweight full-grain leather shoe with a pigskin collar lining. The elasticity of the adjustable straps maintains a comfortable fit even as your feet swell over the course of a long day. The outsole is made of a new type of polymer we call Oasis Grasp. This has been specially formulated after extensive testing and the result is a unit sole with excellent cushioning properties that is durable and provides excellent traction. Our nylon and fiberglass composite shank stiffens the shoe along its long axis while still allowing the torsional flex your foot naturally needs to relieve stress on your ankles and knees.The radiused heel and generous toe spring help minimize tripping and allow for a smooth and comfortable stride.The removable footbed has a contoured surface. A foam spacer beneath the footbed can be removed to accommodate orthotics or customization. The Trek-Dry vamp lining wicks moisture and has been treated with an anti-microbial agent.The upper is made of the finest full grain leather. Many of our shoes have an insole/midsole/outsole assembly featuring six elements working together as a system. Only Oasis offers all these elements together as a system. Extra Forefoot Cushioning – In our men’s shoes with F.C.T. the strobel innersole covers a layer of shock-attenuating polymer gel. It is easy to provide shock absorption in the heel where the thicker midsole gives us more to work with, but in the thinner forefoot only Oasis offers this type of protection. Full-Length Shock-Absorbing Midsole – All our shoes have full-length compression-molded EVA (ethylene vinyl acetate) or EPR (ethylene propylene rubber) midsoles. This provides cushioning for the entire foot. Some companies offer rubber “cup soles” which provide little or no cushioning. Foot Cradle Technology (FCT) – A thermoplastic polyurethane (TPU) heel cup compliments the flexibility of our shoe’s forefoot by supporting and stabilizing the rear foot. Most of our men’s styles have F.C.T. Nylon Composite Shank – Composite shanks are state-of-the-art. Unlike steel shanks, composite shanks are molded together with the midsole. This means they are always positioned correctly, there are no sharp edges, protrusions, or uneven surfaces, and their shape varies according to shoe size (not “one size fits all”). The composite shank stiffens the midfoot but has been engineered to still allow for just the right amount of torsional flex. Steel shanks do not do this. Composite shanks also add less weight than steel shanks. All these characteristics combine to create a more comfortable walking shoe. All our extra-depth shoes and slippers have composite shanks. Abrasion-Resistant Outsole – The outsoles of our men’s extra-depth shoes are made of abrasion-resistant synthetic rubber. It provides excellent durability and grip on all surfaces. It has slightly flared sides to help stabilize the foot. A rounded heel strike area combined with extra “toe spring” creates a “rocker” effect which allows the foot to gently roll through the gait cycle. The entire perimeter of our outsole has a radiused edge making it more difficult to “catch an edge” thereby reducing the chance of tripping or stumbling.